Rosetta spacecraft's OSIRIS narrow-angle camera obtained this close-up detail of a smooth region on the "base" of the "body" section of comet 67P/Churyumov-Gerasimenko on August 6, 2014. It's only been a few hours since Europe's Rosetta spacecraft arrived at a comet in deep space, but the robotic probe is already beaming incredible close-up photos of its target. The latest images from the Rosetta probe reveal details on the surface of Comet 67P/Churyumov-Gerasimenko like never before. 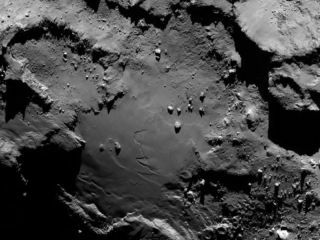 House-size boulders can be seen on the surface of the comet, and the "neck," "body" and "head of the dirty snowball are all on stark display. The photos were taken when Rosetta was about 81 miles (130 kilometers) away from the comet. Rosetta spacecraft's OSIRIS narrow-angle camera obtained this close-up detail of comet 67P/Churyumov-Gerasimenko on August 6, 2014. The comet’s "head" lies at the left, casting shadows onto the "neck" and "body" to the right. And McCaughrean wasn't alone in his enthusiasm at Rosetta's mission operations center in Darmstadt, Germany. "This is a very, very emotional moment," Holger Sierks, the principal investigator for Rosetta's OSIRIS instrument, said during the webcast. "You see a lot of detail coming out here. We see the bright areas. We see the head. We see the depression and a lot of stuff laid out there. We see the sides, the body, the lower body of the nucleus and a lot of detail." Both Rosetta and Comet 67P/C-G are flying in tandem at about 251 million miles (405 million km) from Earth. Rosetta set off on its quest to link up with the comet in 2004, traveling about 4 billion miles (6.4 billion km) before making its historic rendezvous with the comet this morning.While today does mark an event 10 years in the making, it is just the beginning of the mission for many ESA scientists. ESA officials still need to find a suitable landing spot for the Philae lander, a robotic craft that hitched a ride with Rosetta to the comet. Philae (named for an obelisk found on an island in the Nile River) is designed to touch down on the surface of Comet 67P/G-C to learn more about the composition and properties of the 2.5-mile-wide (4 km) comet. Rosetta spacecraft obtained this 330 second exposure of comet 67P/Churyumov-Gerasimenko. from a distance of 342 miles (550 km). The comet nucleus was saturated to bring out detail. Note a ghost image floats at the right. Mission controllers will now put Rosetta into a triangular orbit around Comet 67P/Churyumov-Gerasimenko (67P/C-G) before moving the probe closer to the comet. Eventually, Rosetta will move into an even tighter circular orbit to release its lander down to the comet's surface in November. The $1.7 billion (1.3 billion euros) Rosetta mission is expected to end in December 2015 when the spacecraft moves away from Comet 67P/C-G. Before the end of the mission, however, Rosetta will accompany the comet as it makes its closest pass of the sun in its 6.5-year orbit. During that close pass, the probe should be able to observe the comet in a very active state. "After landing, Rosetta will continue to accompany the comet until its closest approach to the sun in August 2015 and beyond, watching its behavior from close quarters to give us a unique insight and real-time experience of how a comet works as it hurtles around the sun," Matt Taylor, Rosetta project scientist, said in a statement.